As I dimmed the lights and got lost in this astounding masterpiece, I realized that despite his notoriety I never once viewed Travis Bickle as just some famous movie character. 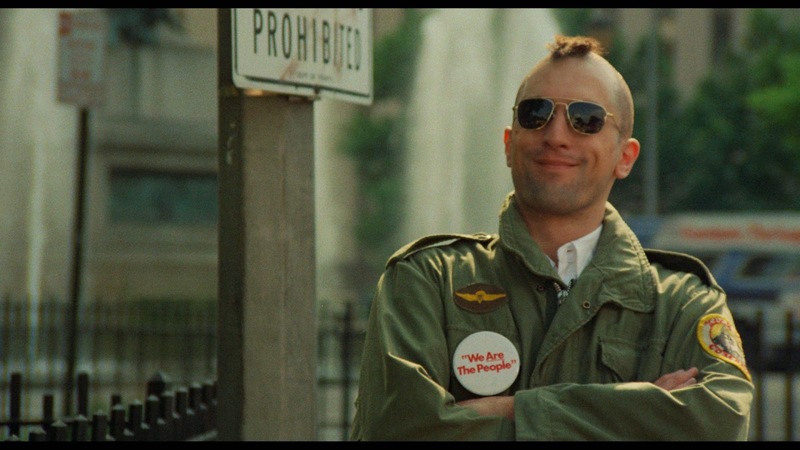 Travis Bickle is not a Halloween costume or a poorly executed impression used as a punch line in a sitcom. Travis Bickle is human, a man haunted by a world that surrounds him which he doesn't fully trust or understand. We don't merely follow him around, we see the streets of New York City from his perspective. We see the people he perceives as scum, the portion of the populace that he would eliminate if he could to make the world a better place. Often times the glare of their faces staring back at him are illuminated by a red glow that almost makes it feel as if the frame had been soaked in blood, or we barely see them at all, an ominous shadow cast over a city that he chooses to wander through each night despite the hatred he feels for those that occupy it. Travis Bickle isn't a mohawk or a jacket or a taxi cab or a single quote people love to say when they look at themselves in the mirror. 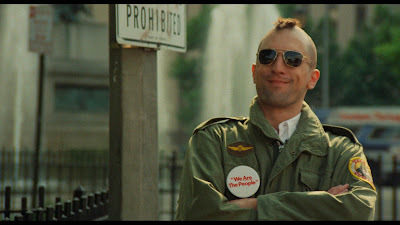 Travis Bickle is human. The way Scorsese films him is so real and fascinating that he somehow manages to make this unstable and violent man both terrifying and strangely sympathetic. 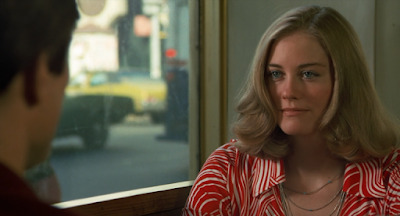 When he approaches the beautiful and classy Betsy (Cybill Shepherd), it is completely understandable that she would be intrigued by this mysterious man. He is confident, he has charisma, and he stands out in a room full of strikingly similar and less exciting men. At one point after the relationship has taken a turn for the worst (for understandable reasons), Travis calls Betsy from a pay phone and just at the moment when it becomes obvious he is getting turned down for a second chance, the camera slowly moves to the right and looks down a hallway. My immediate reaction was to wonder, what is going to happen down there? The answer is nothing. Scorsese makes it clear that we shouldn't see Travis at this moment, but why? Is this another example of humanizing this evil man, that we are giving him privacy during this personal moment of failure? Or is the camera still functioning from the perspective of Travis, that we cannot see him because he wouldn't want to be seen at a time like this. Despite the various moments throughout the film that any rational person would find at best to be questionable behavior, perhaps the only moment that Travis feels ashamed of is the one in which he let the beautiful girl get away. 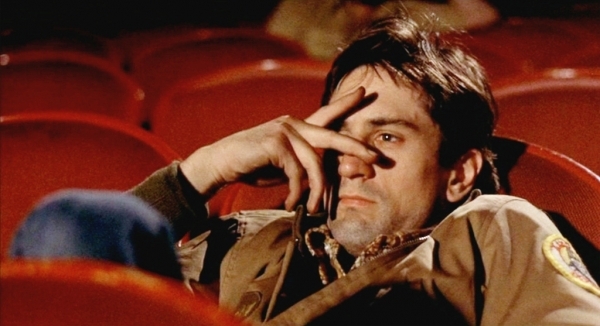 Seeing Taxi Driver again, at a time when I have learned how to truly appreciate the medium and gained an understanding of the subtleties that elevate a work from good to great to an essential work of art, I am floored. Every frame was like visual poetry, with nothing done accidentally or merely for aesthetic pleasure. This is a film that breathes life into the very soul of why we watch movies. The casting is absolute perfection which is what makes everything I mention above work so damn well. A character as deranged as Travis Bickle is humanized because of the way DeNiro conveys emotion and feeling with even the slightest look or mannerism. When he first meets Betsy, he pegs her for being lonely and sad despite looking the part of what other women would typically envy, and we know he is spot on even though she doesn't actually verbally confirm it. We know this because her eyes suggest the truth, that at the very core of her being she is searching for something more from this world than looking pretty and working overtime on a political campaign. When Travis crosses paths with the very young Iris (Jodie Foster), she portrays an image that attempts to convince the world that she is okay living life as a 12 year old prostitute, but when he calls her and her ways out for being so obviously wrong we know instantly she agrees even though she never says so. We see the pain in her eyes, the suffering caused by an adolescence that was never allowed normalcy, and I felt this reverberate through my entire body. It takes a whole lot of talented people working with a singular, brilliant vision to craft a picture like Taxi Driver, the type of achievement that will force me to make the tough decision of which film to knock off of my all time favorites list so I can free up a spot. As I said before, I now can appreciate the different between good, great and essential. Taxi Driver is essential. 2nd cameo in this film or just the fact that he had a cameo at all? Because the one was obvious, in the cab, but I didn't notice another one. We may disagree a decent amount Peter, but this and Psycho being tied for best film ever are wonderful choices. The casting is absolute perfection which is what makes everything I mention above work so damn well. The Taxi Driver Review shared here are great, I am flattered with getting to the taxi wordpress plugin and seeing this awesome share here has boosted it all up for me, Keep updating more about the Taxi Driver.